Thank you for your interest in visiting Syracuse Law. It is recommended that you schedule a visit at least 1-2 weeks in advance. The Office of Admissions is closed from Monday, December 24th - Tuesday, January 1st. Our office is available for tours + appointments with admissions and/or financial aid counselors Monday - Friday from 9 am - 4 pm. Guided tours are offered twice a day, Monday - Friday (with the exception of holidays) and will last approximately 30 minutes. Note: Should you wish to visit the law school within the next 1-5 business days, please call or email the Office of Admissions at 315-443-1962 or admissions@law.syr.edu so we can process this request in a timely manner. 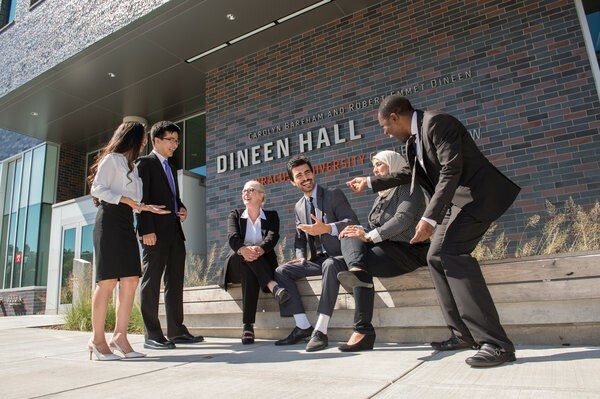 ​If you are unable to visit us in-person, take a virtual reality tour of Dineen Hall today!